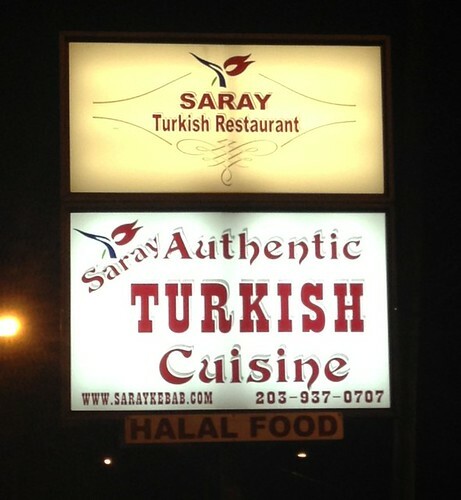 Saray Turkish Restaurant | Eat It, Damn It! I would stop there because MG is cutting down on gluten and dairy. That makes pizza eating kinda’ difficult. To say Saray is not Zuppardi’s is doing a disservice to Saray. However, getting off the exit ramp, I just couldn’t help but think about Zuppardi’s being a few minutes down the road. I was already setting up an obstacle that Saray would have to overcome. The dining area is very large and open. MG and I went on a Friday evening, and business was brisk. There were a number of reserved tables, some seating 15 or more. 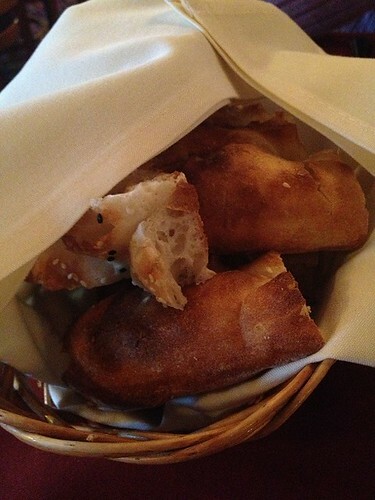 The complimentary bread was very nice. It went very nicely with our appetizer. 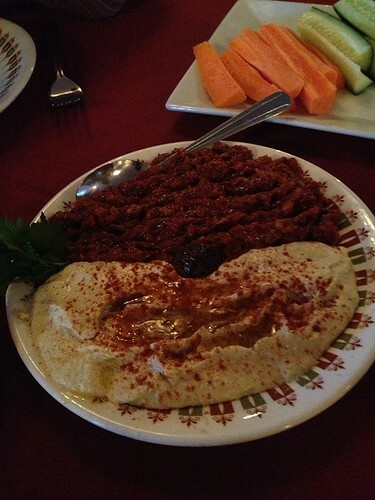 This is the Hummus and Antep Ezme combo. According to the menu, Antep Ezme is “Onion, Red & Green Peppers, Tomatoes, Walnut and Garlic all made into a delicious dipping paste.” Translated, that means “complex gaggle of flavors that create a memorable mash of savory, hot, and sweet in your happy mouth.” The Hummus was forgettable, the Antep Ezme was sublime. It is a must order. 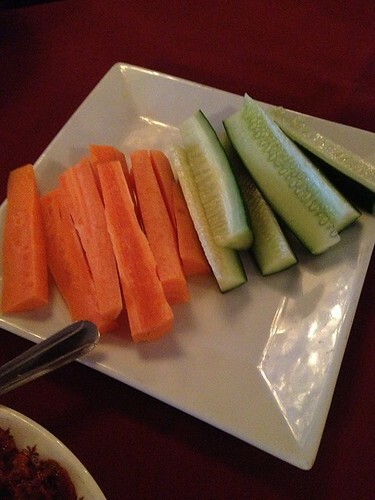 As MG is sans gluten, she asked for some cold vegetables to dip into our appetizers. Check out the nice array that the waiter gladly brought out. He gets a big thumbs up. 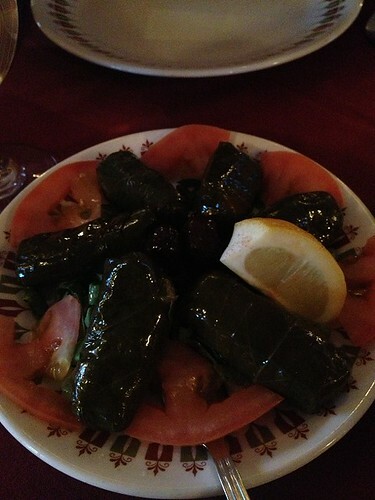 I’ve seen stuffed grape leaves with a number of different names. Saray listed theirs as Yaprak Dolma. Whatever, as long as it tasted good… and it did. Balanced between savory and tangy, these little beauties were exactly what I wanted. They did not amaze me, but they certainly did not disappoint. 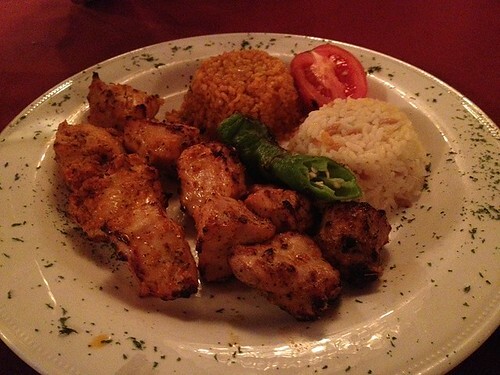 For the entree, MG selected the Chicken Shish Kebab. I rarely order or eat shish kebab. If done properly, it has a nice, rich, smoky flavor. Done poorly, it’s burnt on the outside and barely cooked inside. This offering was done properly. Tender and juicy, the chicken retained some of the flavor from the grill. The exterior had the proper amount of resistance without becoming tough or crusty. People that fear spice should not worry with this dish. It was rich in flavor, but only offered a slight bit of tingle to the tongue. I felt adventurous. I went for the Saray Special Pie. 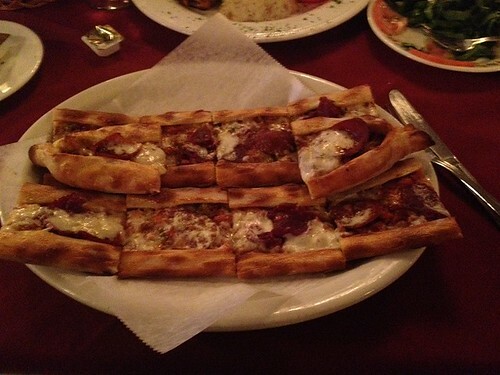 “A thin round crust, dough with Turkish Pastrami, ground beef, Turkish pepperoni and Kashar cheese.” The best way I can sum it up is “Turkish Stromboli”. Nice, but it didn’t make my toes curl. The Turkish Pepperoni is the dominant flavor, and I don’t think it tastes unlike standard Pepperoni. If you are traveling to Saray on a weekend, I would recommend making a reservation. The service is friendly, but they appear to be a little undermanned. That last sentence will seem a little odd when you walk in and see a plethora of waitstaff, maybe 10 or more. However, while there were constantly people going back and forth from the kitchen, filling water glasses, and bringing out dishes, I don’t think more than three were actually taking orders and delivering cheques. There definitely wasn’t anyone sitting on their hands, but it was a little difficult to get our waiter’s attention. Perhaps they need a better workflow strategy. Maybe it was an off night. Nevertheless, the staff is friendly and helpful once you actually get their attention. Did Saray make me forget Zuppardi’s? Let’s just say, if I’m in that area and I definitely don’t want pizza, Saray is a nice option.